Successful businesses are always evolving. Being able to create prototypes quickly, try out new ideas and test concepts in an affordable way are all vital processes if you want to stay ahead in your sector. Our digital manufacturing processes such as 3D printing (FDM and SLA), laser cutting, 3D scanning and CNC machining, enable you to do all this, without the traditional costs involved in manufacturing. The images above show an example of the digital design and manufacturing process here at the Fab Lab. A CAD file was supplied, small alterations where carried out in Fusion 360, then the virtual model imported in to Cura, a support structure was developed and coded for output. It was then 3D printed in silver and flexible PLA filament. This open source product (designed by Design & Business LLC) was developed for a local company that provides medical health training worldwide. Using our CAD designs to produce high-quality components that were economically manufactured with no waste has given Plasloc tangible prototypes. The fast turnaround has been breath-taking and added to the buzz of developing a new product. The facilities offered here will greatly assist companies to stay ahead of the competition. Need to make a new part? Or see how different components could fit together? Our 3D additive and subtractive prototyping facilities enable you to make an item at a fraction of the usual cost and try out multiple versions easily, to ensure you have the right solution. We accept all types of CAD data, from Solidworks to Rhino, Fusion 360 to AutoCad. We can also provide CAD modelling and advice on all aspects of of 2D and 3D digital design software. Depending on the needs of your company we can offer technical advice, support and run short training sessions on different aspects of digital manufacturing, to help empower your staff and grow your business. We even offer team building days that don’t involve getting wet and muddy! 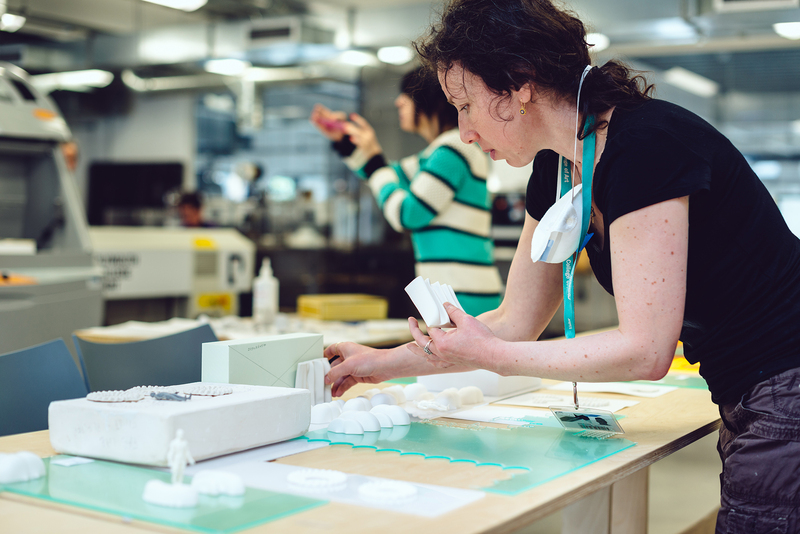 From creating robots to problem-solving, our Fab Lab away days are hugely popular. The Fab Lab team will work alongside your technical or design department, and we always treat all commercial projects in the strictest of confidence. Please contact Ben Mundy at the Fab Lab at bmundy@pca.ac.uk or call 01752 203434 ex. 298 to discuss commercial access. We successfully worked with Fab Lab Plymouth to produce high-resolution, rapid prototype models prior to manufacturing — we were impressed with the facilities on offer and the friendly, positive customer service.